A "Frosty" Gaspacho style soup, only without any red ingredients such as tomatoes. Think lettuce, spinach, cucumbers, green onions, celery and such when putting this one together. Use chicken broth as a base instead of tomato. Want all vegetarian? 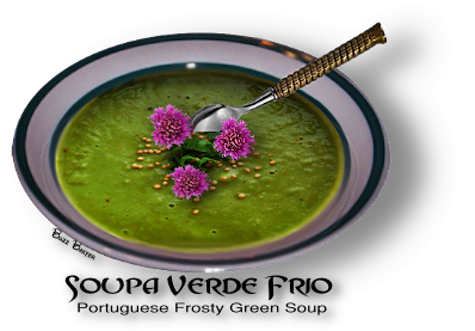 Use a cold vegetable broth as the base or use pureed tomatillos. 1. Put all vegetables in a blender and puree them. 2. Add chicken broth mixture. 1. Blend for 1 minute. 2. Refrigerate for 2 hours before serving.